Taking care of sensitive skin doesn’t have to be hard. Each individual pac of Tide PODS Free and Gentle fights stains, brightens fabrics and is specially designed to include no dyes and perfumes. Simply pop one into your wash to get an outstanding Tide clean in any size load, temperature or machine. For a simple, worry-free laundry experience that’s gentle on skin, Tide Pods Free and Gentle will keep your family looking and feeling great. Caution: Keep out of the reach of children and pets. Do not put in mouth or ingest. May irritate eyes. Do not get in eyes. Always close container after use. Never handle pac with wet hands. Store in a cool, dry place. No scent and no residue. Not the cheapest option, but the convenience is worth it. Use these for all my washing. No scent and very gentle on the clothes. This product always gets the job done well. I love this product. Unscented for my more sensitive family members. And proportioned, as I tend to be heavy handed with laundry soap in large bottles. These have been perfect (and easy!) for washing baby clothes. Will continue to buy! This is my normal laundry soap. We have allergies here and this has been a god-sent. Always use this product, gentle on the kids clothes. Having very sensitive skin I've searched for laundry detergent that works well on cleaning, but is also good for sensitive skin and this product works great for both. I love the pods, just toss one in and that's it. Phosphate free, frangrnace free AND cleans well! Great detergent! I started using it for baby's clothes because it's so gentle, now I wash the whole family's clothes with it. Finally tried this one compared to the usual Tide pods we usually buy, and these are great, gentle on the skin, as said on the packaging. Love them. So gentle on skin, I use them for my infant daughters laundry. I use this product with my 91 year old Mom's laundry. Her skin is delicate and requires special care. 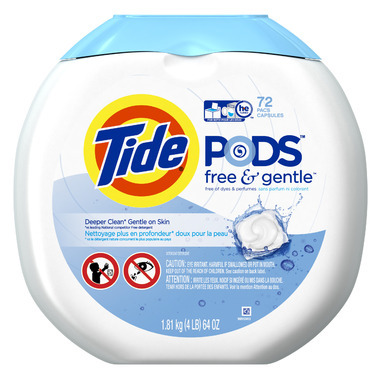 Tide Free & Gentle Laundry Detergent PODS deliver the cleaning power associated with Tide products but with the gentleness of baby soap. Great product! I really like this detergent, especially for my bedding and towels. My skin tends to be dry and sensitive and I have noticed a vast improvement since I have been using it. With other detergents I jave often felt the need to use the second rinse cycle - especially for towels - to make sure there was no detergent residue left to irritate my skin. Very good laundry soap cleans very well on all types of laundry and was a very good price. I have been using this product for a couple of months, and I am quite satisfied so far. As others mentioned, it is easy to use (no need to measure), it cleans great (I haven't tried with 'extra dirty' clothes, but it has been working fine with regular laundry). And I like that it's scent free, as I am not a fan of Tides (or other brands) other scent products. So, overall, I think it is a great product and would recommend it. LOVE LOVE this product! No need to measure messy liquid or have to fuss with cups. Just toss in the pod and go! No scent and cleans great! Very convenient to use. No measuring. I use it to wash my pets blankets and I also to do the grandkids clothes. Works very well.